TEDx Events are tremendously successful around the world; the mission behind these events is to generate and share “ideas worth spreading.” These events are independently planned and cover various themes from movements in space to the “bridgewalkers” in a community. TEDxSaltLakeCity is of particular interest to us because its 2014 event was planned and organized using Kona. Let’s take a closer look at how organizers Anna Decker and Scott Follett, Jr. executed the event. Anna came to the partnership with experience in planning events and coordinating groups of people; Scott was new and eager to join Anna in a collaboration for TEDxSaltLakeCity 2013. They relied on different tools and systems to organize the planning team and execute their first TedX event. With a private Google Drive account, the team could store and collaborate on all their files. The downside? Several members were not very comfortable with the system, but they persevered. Communication took place in email and the team’s Facebook group. The @ mention feature in Facebook allowed for individual call-outs and targeted discussion; however, team members weren’t sure when to use email versus Facebook. All in all, tasks were accomplished in time for a successful 2013 event. But looking back at this experience, Anna and Scott realized that there are far too many parts involved in the planning process to manage it without a collaboration framework. Scott reflected on their own planning committee and decided to align the planning with the 2014 TEDx event theme: bridging gaps. What would a more dynamic solution look like for their group, one where they could store files, track progress, capture deadlines, and more? Scott began researched multiple PM solutions (Base Camp, Nozbe, etc.) and chose Kona because of its more intuitive interface and because of the incredible customer service he received when he reached out to learn more.. 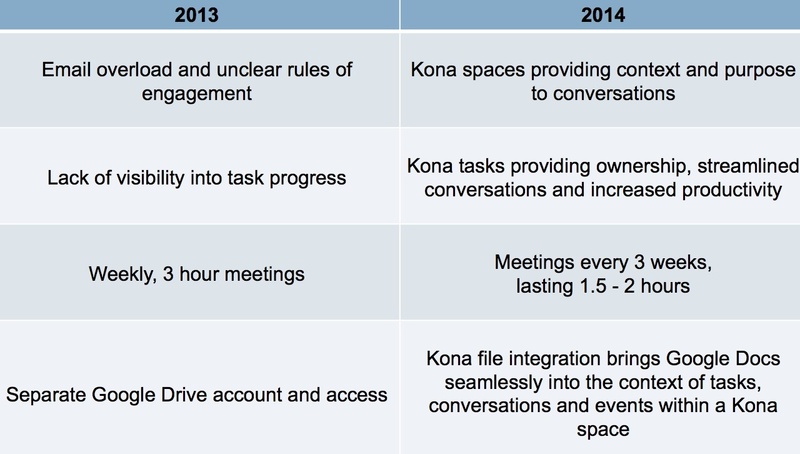 He quickly saw that Kona was much more than a task management solution, and that it would provide them with a collaboration platform for all the communication and coordination necessary to execute a successful event this year. After all the planning was done and registration opened up, the event filled up instantly – all tickets to the exclusive event sold out in just four hours and hundreds more spots were reserved at the free university, library, and business incubator livestream sites throughout the city. Introducing Kona to the process also couldn’t have been more timely, as this year’s event was centered around the “bridgewalkers” in Salt Lake City, the people and influences that “bridge the current gaps in information, communication, and innovation to optimize resources and make Salt Lake a model for the world.” Kona certainly served as the bridge for Anna and Scott, as they improved team communication and effectiveness in 2014. Looking ahead to next year, Anna and Scott would like to utilize space templates, add guests like speakers and vendors to their spaces, and implement best practices across team spaces. Anna has already begun spreading Kona across her personal life and Scott now has to take his own advice and starting using it in other aspects of his life too!